It’s safe to say that development of the new mid-engine C8 Corvette isn't going smoothly. The car’s electrical architecture is reportedly causing issues that have delayed production, and the model’s aluminum spaceframe is suffering "structural distortion” in the high-performance variant, which will be powered by a twin-turbo V8 producing between 900 and 1,000 hp. And now the mid-engine Corvette has faced yet another setback, as a member of the Corvette Forum claims that a prototype recently crashed during testing at the Virginia International Raceway. The user says they were on their way to do some instructing at VIR last weekend when "an email was sent delaying any entry into the paddock until 7:30 PM at the earliest.” This is apparently later than normal. Event organizers then apologized saying the track was experiencing delays due to a "private high security” track rental. They then heard some chatter at the paddock that Chevrolet had rented the track to test the twin-turbocharged version of the mid-engine Corvette C8 when it crashed and caused delays. We don’t have any photos or videos of the accident, but the user added some photos of some camouflaged body panels that were apparently recovered at the race track after the accident. 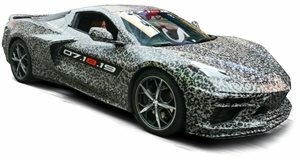 They don’t appear to be damaged, but they do have a similar camouflage pattern to other C8 Corvette prototypes we’ve seen being tested. Another user claimed they saw "at least 6, possibly 7” C8 prototypes pass their house near the Virginia race track. Later that day, there were only five left in the fleet, so it’s possible that one of them crashed. The ZR1 set a lap record at Virginia last year beating the Ford GT, so it seems plausible that Chevrolet would test the new C8 Corvette at the same location. 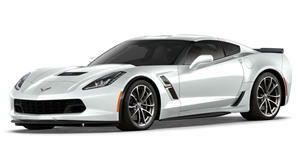 It still isn’t clear when the mid-engined Corvette will break cover. Latest rumors suggest it could be revealed at the New York Auto Show next month, but the car’s technical issues reported last December have allegedly delayed its debut by six months, so we may have to wait until the summer for the C8 Corvette to debut.